My almost 6 years in the blogosphere have been a play of throwing mud on the wall, hoping something would stick. I started by attending some media events, then I ventured to the art of food appreciation, went to some out-of-town trips with friends and shared the experience, and even started developing my style to try a hand on fashion blogging. Because I had no specific niche, I put my blog under the lifestyle category. It was good in a sense that I had more materials than most bloggers, but it was also bad because I couldn’t get a focused set of readers. But for four years, 90% of my content was food related, and though I have now shifted my focus on travel, I do not regret writing about food at all. I mean how could I, when it’s the thing that landed me a TV guesting on the TV show, Pop Talk of GMA News TV 11. Sometime in February—or maybe it was January, I don’t recall anymore—my friend, Richie, (The Pickiest Eater) asked me if I was willing to be a guest reviewer of Pop Talk. Of course, I did, so I ditched my friends and prepared myself for my first ever TV appearance, lol (My friends understand, they love me!). But for reasons unknown, the gig didn’t push through. My time has finally come this March, thanks to Richie who once again recommended me to the Pop Talk people. Cess, the researcher of the show contacted me to know if I was available the next day, March 3. That’s a Thursday and I have work, but I’ll be damned if I let this opportunity pass me by. I’m going to be on Pop Talk come hell or high water! I wore my black dress, kept my makeup to a minimum (because I heard there’s a makeup artist), then took a bus ride to Quezon City. You know that feeling of dread that you get when you’re about to be late on a job interview? That’s what I felt when I looked at the time and saw that it was a few minutes before 9AM but I still couldn’t see the GMA 7’s building on the side of the road. I texted my apology to Cess, but she told me not worry because even some members of the crew were also stuck in traffic. We met at a Starbucks and after she bought me a cup of latte, she went back to her office and said she’d come back for me later. For an hour, I waited in the café. When Cess returned, she motioned me to follow her outside, to this van waiting on the parking lot. “Do you know Ryza Cenon?” Cess asked me. Ryza Cenon is an actress who was discovered in the reality TV show, Starstruck. She was hailed as the ultimate female champion it its second season. Yes, I know her, in fact I rooted for her to win. Clad in a gray shirt and high-waist shorts, I spotted the actress sitting behind the driver’s seat flanked by another girl. I didn’t get the name of the girl, but I heard she is the handler of Ryza. After I said hi, I took the seat behind them and spent the next few hours dozing off as we made our way to our first stop, Las Piñas. 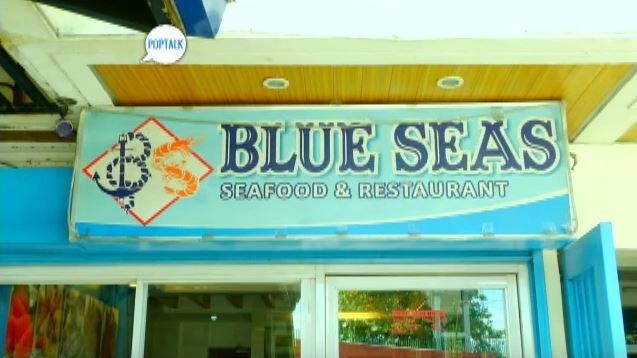 The first restaurant that we visited is Blue Seas Seafood & Restaurant; a no-frills dampa-style restaurant owned by Ricky Pajarillo, a former fisherman from Romblon. When I say dampa style it means you can order their seafood product and have them cook it for you. The restaurant opened in December 2013 and its name came from the kind of seafood that they sell, such as tuna, salmon, blue marlin, etc., which can only be caught from the blue sea. The owner started into the business by being a distributor to the wet market. The business bloomed and now they have their own restaurant. The crew had already set up the equipment when we reached the place. The host, Tonipet was inside fiddling with his phone. The segment host, introduced me to him and to the other reviewer, Chef Mickey. Soon, Tonipet and Ryza were engaged in conversation while I sat on a chair for my hair and makeup. When the makeup artist held up a pink lip tint, I almost voiced out my objection because pink lipstick makes me paler than I already am. I decided to just keep my mouth shut though and see how it goes. When it was time for the shoot, they told me to sit on the far right side of the table, flanked by Chef Mickey. I was only able to exchange a few pleasantries with Ryza and Tonipet, but with Mickey, we were able to talk about some things; like the fact that he and his wife have many dogs and that they love reading travel blogs but couldn’t leave themselves because nobody else would take care of their dogs. I thought I’d be a nervous wreck but I found myself unusually calm when the camera started rolling. One by one, the dishes started coming in. When I saw Tonipet taking pictures of the food, I wanted to hit myself in the head for not taking out my phone from my purse, which was sitting on the other table. I’m not used to reviewing food verbally, so I found myself struggling a bit. In fact, the segment producer had to keep on reminding me to say something. Out of the 3 restos that we visited that day, Blue Seas had the most simple interior. Nothing too fancy, the space is small, there are just some long tables and chairs, that’s it. But I appreciate the fact that it’s clean, even the restroom, which is one of the crucial things that I look for in a restaurant. The strong suit of Blue Seas is the food; there is no dish in this resto that I didn’t like. Every dish that they served us was fresh and delicious. The cooking charge for a half kilo of seafood is PHP 140 (USD 3.02) while it’s PHP 195 (USD 4.21) for 1 kilo. I say that’s pretty cheap! But if you prefer short orders, they offer them too. The price of the food ranges from PHP 160 (USD 3.47) to PHP 1,740 (USD 37.75). They served us so many food I decided to skip the rice. We had Grilled Tuna Belly, Crispy Tuna Belly, Salt & Pepper Shrimp, Baked Scallop, Buttered Shrimp, Adobong Pusit, Sinigang na Salmon Belly, Kilawing Malasugue, and Buttered Chili Crabs. The crowd favorite is the crispy tuna belly, which is basically tuna chicharon. It was so tasty and crispy that we had fun picking them off the plate and popping ‘em to our mouths. I was sort of expecting it’d be hard to chew but I was wrong. Great news to non-pork eaters; there’s a chicharon for you. Out of all the dishes, my favorite is the sinigang na salmon belly. I love that the meat of the salmon was so tender it practically melts into my mouth. I also enjoyed kilawing malasugue because the diced meat of the fish was soft, with just the right amount of sour flavor that doesn’t sting. I took a nap and when I opened my eyes, we were already in Pasig City. 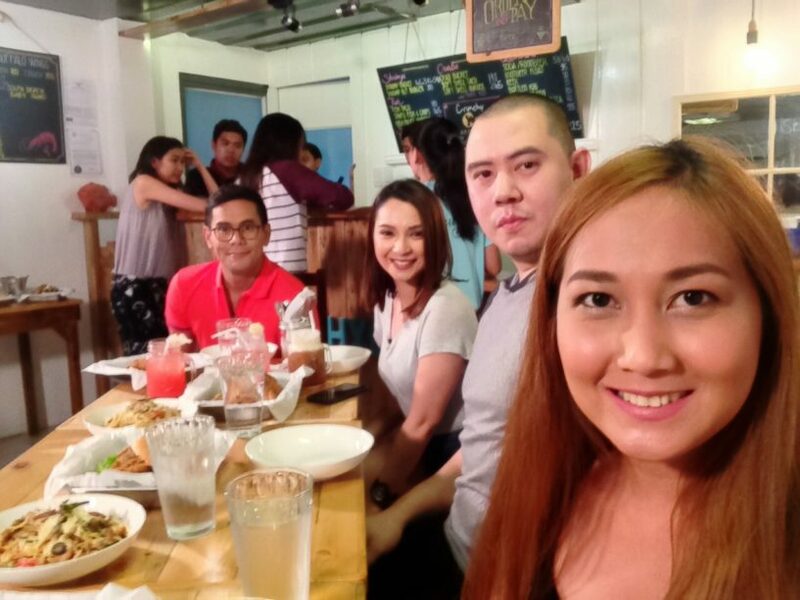 We went to The Alley, a popular food hub in Kapitolyo to try this beach-themed restaurant called, Crunchy Crab. This time, we arrived in the venue with the crew so we had to wait for them to set up the equipment before the take. We were greeted by one if its owners, a 20 something woman named, Kara Limchin. 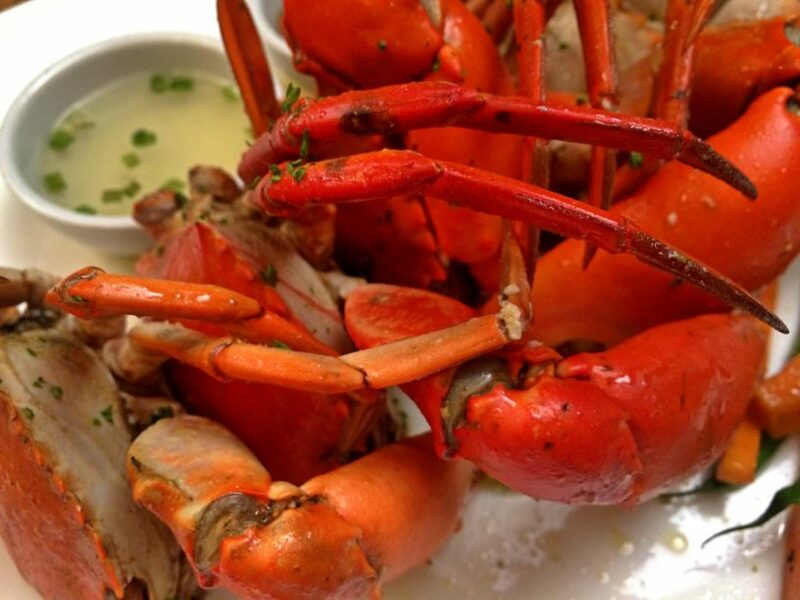 What sets apart Crunchy Crab from their competition is their clever take on seafood dishes. Kara said that they are trying to reinvent seafood in a way that is fun and delicious. Despite this, their food is affordable because they source their products straight from the local suppliers. 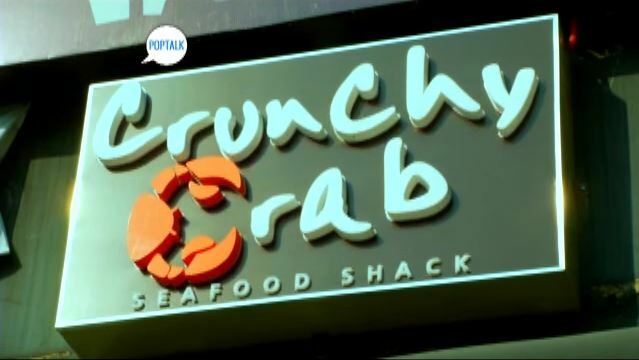 Crunchy Crab is fairly new; they started operating in October 2015. Sure enough, the food that they served is unlike anything I’ve ever had before. 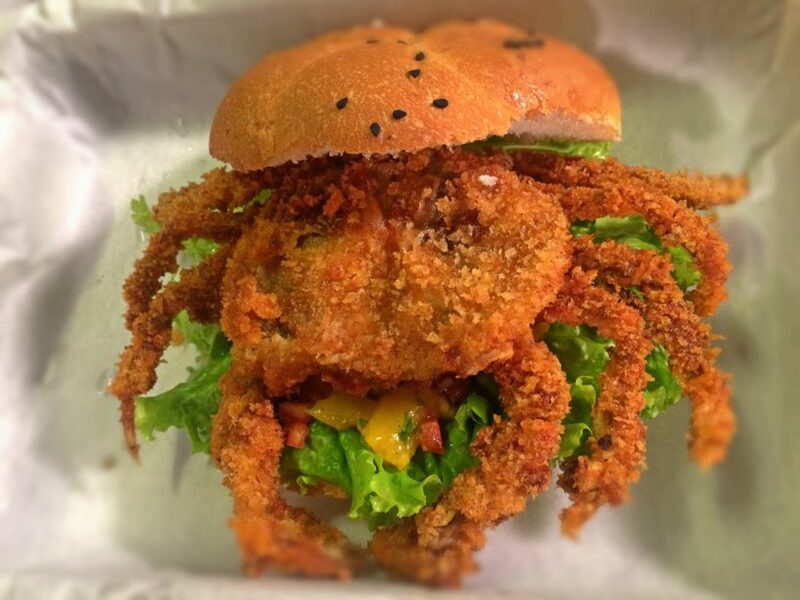 Their bestseller and understandably so, is the Soft-shell Crab Burger. Unlike the regular crabs which edible parts are within the confines of its shell, soft-shell crabs can be wholly eaten. This is because soft-shell crabs are removed from the water as soon as they molt, thereby thwarting the hardening of their shell. Crunchy Crab found an ingenious way to serve these crabs and that is by covering it in a breaded mixture, deep-frying, and using it as a patty of their burger. And I am absolutely in love with this burger, not only is it unique, but also quite yummy. I was close to devouring the entire burger but I had to stop myself lest I’d be full to try the other dishes. But for this burger alone, I am certainly going back Crunchy Crab. Another unique food that is worth mentioning is the Shrimp BLT; that’s right shrimp burger with bacon, lettuce, and tomato. Personally, I’ve never had a shrimp burger before so just like the soft-shell crab burger, this one won my attention, not to mention my approval because the patty is spicy, just the way I like it! 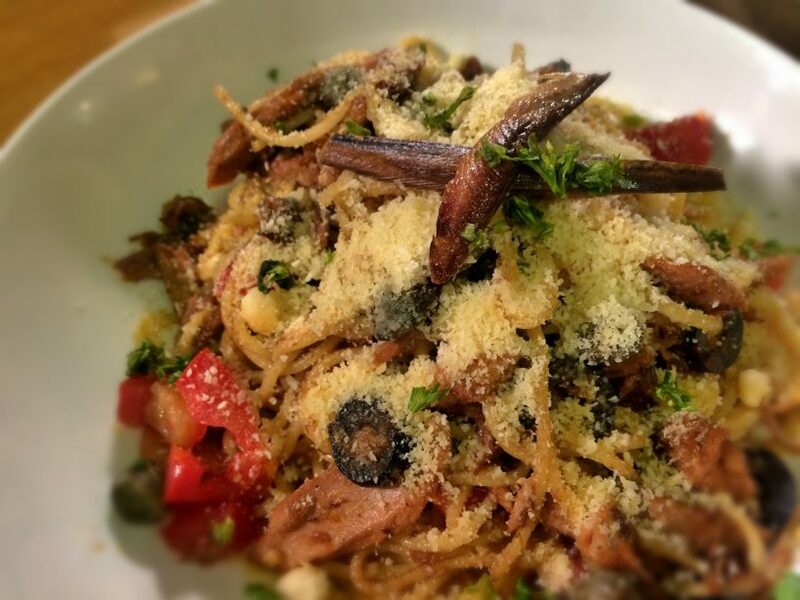 The dish that can use a little improvement, in my opinion, is the 3 Fish Pasta (sardine, tuna, and tuyo). I find the pasta dry, and too salty for my taste. Eating seafood can be messy (hello crabs! ); thank god Crunchy Crab provides plastic gloves. It made the eating even more exciting because I no longer had to struggle with the knife and fork. It was dark by the time we reached our last stop, El Cangrejo. This restaurant opened in October 2013 and is located in South Triangle, Quezon City. 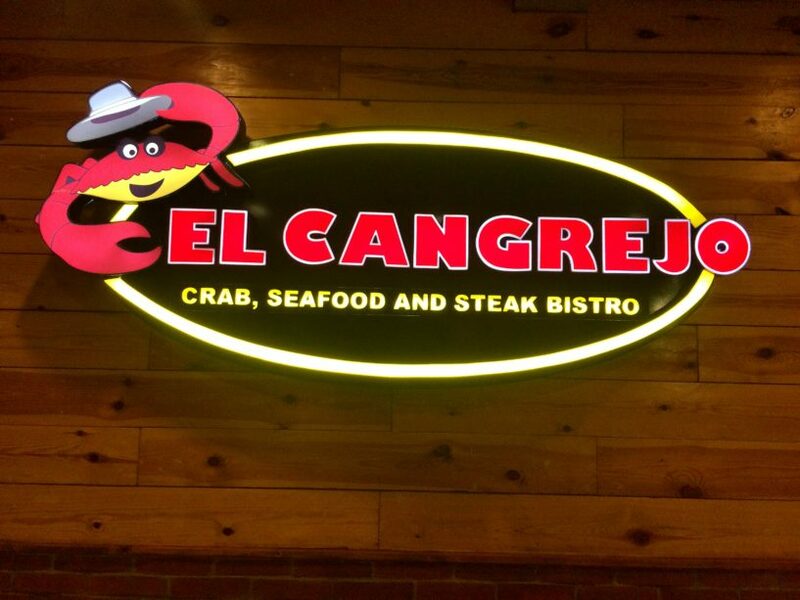 El Cangrejo means “the crab” in Spanish. Predictably, the star of this resto is their unlimited steamed crab. Unlike the first two restaurants where they deliberately closed it for business to accommodate the shoot, it was business as usual at El Cangrejo; they just provided one big part of the room for us. I sensed a dip of energy from everyone by this time, but we still had work to do. When the camera started rolling, we started eating like we haven’t eaten the whole day. The reason would be the food, they were orgasmically good. 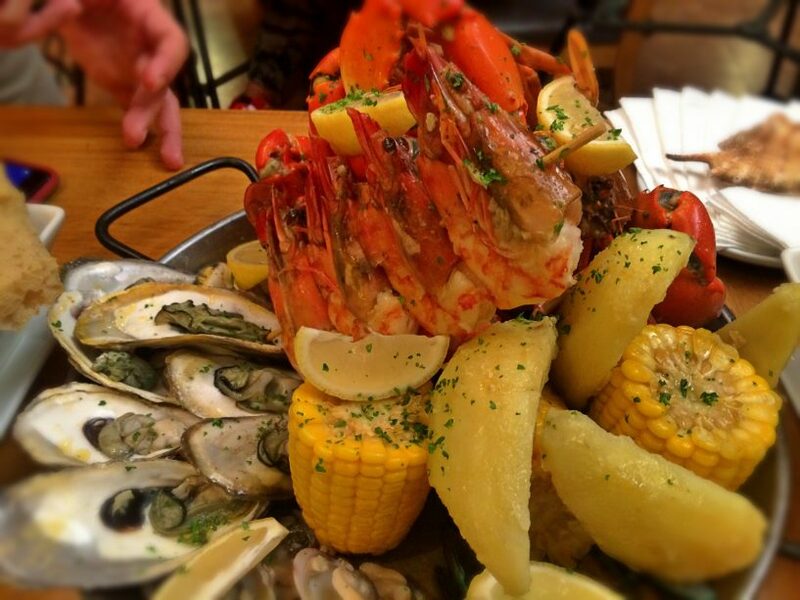 We shared the Seafood Platter (PHP 1,740-USD 37.90). The platter offers a sampler-concept; get it if you want different kinds of seafood in one order. It has shrimps, clams, crabs, oysters, potatoes, and corncobs. This is quite ideal for a group. The Seafood Linguine is fantastic, it’s creamy and flavorful and most importantly, the pasta is not dry. I’m not sure what kind of butter they use on their food but you can taste it in almost all of their dishes, more so with the Baked Scallops. The buttery taste is wonderful by the way, it really brought out the flavor of the scallops. Panseared Salmon was a crowd favorite, so much so that I almost didn’t get a chance to taste it as it was sitting on the other side of the table. Thankfully, Chef Mickey was kind enough to pass me the food that I couldn’t reach. I hardly touched the steamed crabs in other restos but on this one, I went all out. I was on a clam-cracking frenzy, picking and digging those red claws to get to the juicy, lip-smacking meat. I just loved it. 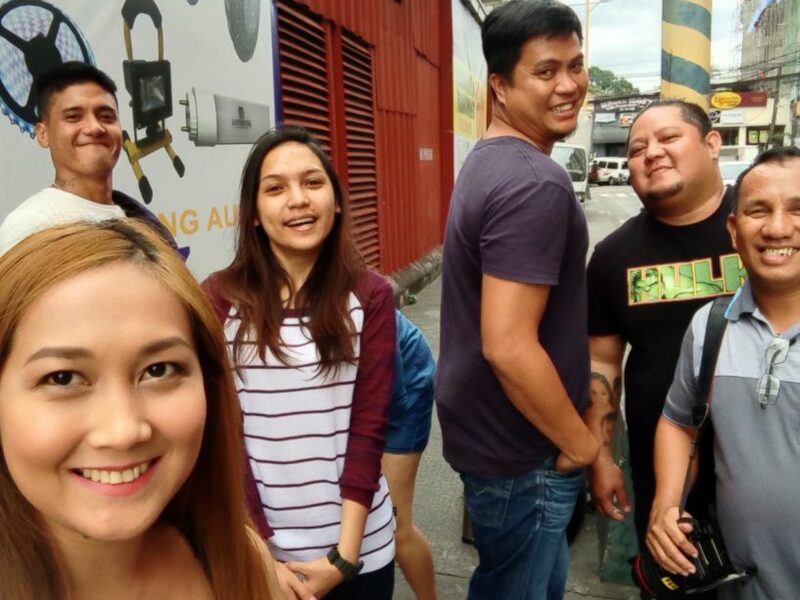 And then just like that, our ultimate food trip is over. Oh no, not yet, we still have to rate the restaurants. But instead of writing about it, why not see it for yourself? Here’s the video. The show aired last March 19, 2016, Saturday. Needless to say, I persuaded my friends to watch it. If you did watch it, thanks so much, if you haven’t, I wish I could give you a link of the complete video, unfortunately, the only thing that is available on Youtube is the last part (that video above). I am so thankful for being given a rare opportunity to become one of the guest reviewers on this episode. The experience was nothing short of exceptional. I’d like to give a shout out to the Pop Talk crew, they are some of the nicest people I’ve met. Thank you Pop Talk! Working with you was pop na pop! OMG! I am so jealous! The seafood looks mouth-watering! Congratulations! Wow that’s so cool to go Pop talk and be the guest reviewer. I know that feeling when you’re late for a job interview. Not nice! How smart to keep your make up little, because of the make up artist. Great that you can write more about traveling now as well, not only food. Wow! You’re so lucky to be given an opportunity to be featured on TV. How I wish I can have that kind of opportunity too hihi. Anyhoo, You’re actually doing great in food reviews. Just keep doing what you love and everything will follow. I’ve seen Crunchy Crab before and I really wanted to try it!! OMG i love seafood, but more than that, I just love the fact that you were able to do a food crawl 🙂 Congrats! I bet a lot of opportunities are coming your way!! That sounds like a fantastic experience! Food and TV, what a combo. I’ve never heard of PopTalk but I will have to look it up. The food looks amazing, I love any type of seafood! Wow! What an exciting adventure. Thanks so much for documenting it in such an entertaining way. These restaurants look amazing. Great story! Thanks for the read. 🙂 That softshell crab burger looks incredible! That is amazing! It looks like you had fun! Is there somewhere we folk in Australia can see you in action? Thanks Anna. I wasn’t expecting to be calm though but I’m glad that I was or it would have been a disaster! Congrats w/ the milestone! With that, you’ll get invites even more. Blogging is like financial investment, the longer your content is out there, the better it’ll be for you. You’re one lucky girl! I wasn’t able to watch that episode, but dang! these photos are enough to make the seafood-lover in me go gaga. Urg. Wooot! I’m a fan of poptalk. You’re definitely an expert with fooood! You deserve this. I bet this was a really cool experience! You got to meet famous people, eat good food and review it live, on camera. The food looks amazing, I would have love to try that crab burger. I am still wondering how did they managed to get it clean whole and then fry it in the same shape. Congratulations! You are definitely an expert on food, so it’s natural you would be picked! I love that crab…can you mail me some? Yay congratulations Marge…i have watched the video and I wish you will have many more tv guestings to come! You did a wonderful job here! What a fun experience being a reviewer. The though part is all the eating, right 🙂 All the seafood looks so amazing and delicious and your videos and pictures tell a compelling story. Hope you get more opportunities on the big screen!!! Yes I did enjoy it. Thanks! Pop na pop talaga! Congrats again Marge! Ayan na ang pinapangarap mo. More tv guestings to come! I hope so hahaha… That seafood platter is the bomb! 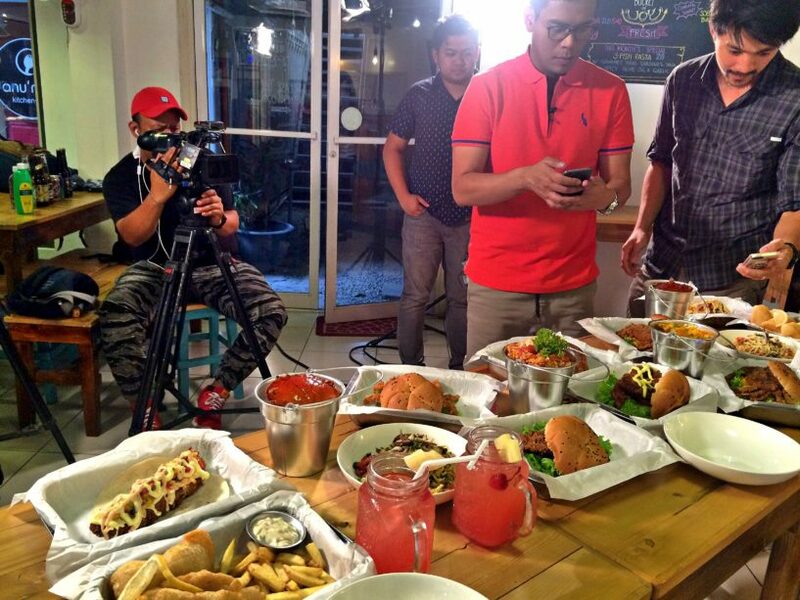 More than the food itself or the restaurants, I feel happy for you for the wonderful experience of being recorded for TV. I am sure it exciting and scary in the beginning, but soon enough, you get used to the idea of having cameras in front of you, staging areas and other background briefings for shots to be taken. Congratulations and more blessings to come your way! “You’ll never go wrong with salmon.” Don’t worry I’ll always put that in mind. LOL! Seriously, you did a great job. Puro comments mo kaya kinuha ng producers haha we’re proud of you, celebrity! ? Hahaha… Thank you Jon! Grabe benta sayo quotable quotes ko!